Terrible actually, I have great intentions, but when it boils down to it I would rather have nachos than carrots, I mean who wouldn't? A couple months ago, right after I got home from South Dakota in June, I discovered I am lactose intolerant. I can eat/drink dairy, but when I do It makes me feel gross. So I've decided instead of eating a bunch of Lactase pills every day to keep it under control, I'd actually try to cut a little dairy out of my diet. So instead of the Lactase being the rule, it would be the exception to the rule. This weekend Katherine and I went to PCC which is a natural food store in our area. There is about 6 of them in a 20 mile radius of me, which is nice. I looked for things that are an alternative to dairy, one thing I really miss about dairy is my morning snack of Yogurt and granola. 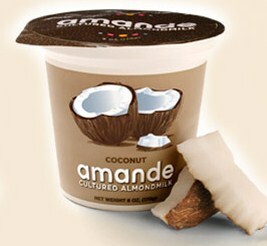 So I found Amande which is a yogurt made of Almond Milk and despite my sheltered tastes I really like it! I can't wait to pick up more! My dear friend Mariya will be so proud! Very proud!! It's amazing what the body is capable of if we give it what it wants and needs ( as well as not giving it things that it has a hard time digesting) I m you'll start to notice little differences and Hopfylly feel better ( not as sluggish) I have never seen to try the almond yogurt, I'll have to double check all my local stores.